Chuck Rogers, Ph.D., and Kenneth Danielson, M.D., of Massachusetts-based Opus KSD, have spent the past several years developing and eventually launching to market, with help from Proto Labs, a surgical tool that combines the best of both worlds: the ease of a stapler with proprietary bio-absorbable subcutaneous fasteners. After Rogers and his team knew what the fastener itself would look like, development of the multipart device began. “Like the fasteners, we initially used FDM and SL on the delivery device in order to inexpensively modify the parts as the device evolved,” Rogers said. The SubQ It! 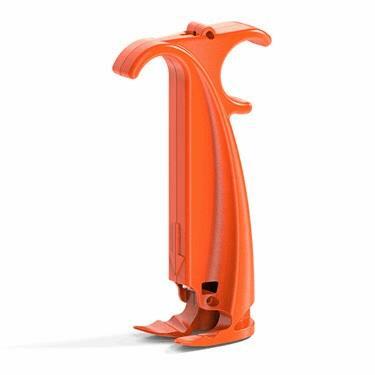 stapler is composed of nine plastic parts, including two exterior shell halves, a plunger operated by the user, and internal parts that feed the fasteners. Proto Labs manufactures all of them through injection molding. The SubQ It! system is designed to make life easier for surgeons and better for their patients, whether human or animal—something Proto Labs is always excited to help accelerate.